Sugar Land, Texas-based HCSS was the second place winner. 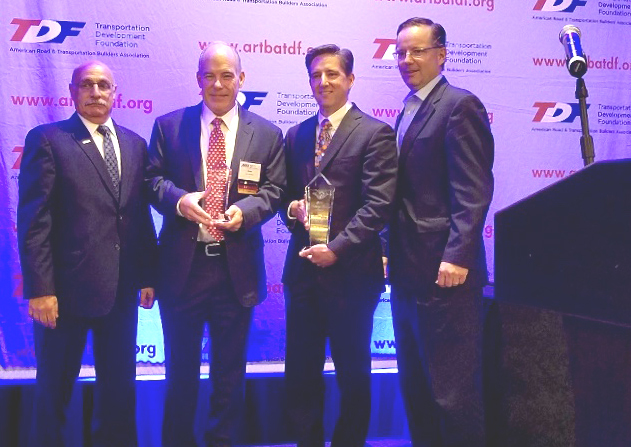 The awards were presented May 15 at an ARTBA Foundation awards lunch held in Washington, D.C. Overall Winner: Terracon Consultants, Inc. Through the Terracon Foundation, the company’s employee-owners give back to the communities they serve by delivering safe, quality facilities and infrastructure projects that support strong, vibrant communities. Terracon encourages employees to submit requests for one-year grants for local organizations aligned with its company’s mission of “using the earth’s resources at a rate in which they are naturally replenished while not compromising the ability of future generations to use them.” Each year, the company participates in hundreds of philanthropic and civic events near its 140 local offices across the nation. Since its inception in 2008, the Foundation has awarded more than $1.6 million to community organizations, universities, dependents of employees, and natural disaster victims. In 2017 alone, the group provided nearly $300,000 in grants to worthy causes. Among the recipients: the Society of Women Engineers, for its work engaging the next generation of female engineers; the rollout of the Girl Scouts of the USA’s “Girl Scout’s Math in Nature Badge” curriculum; university scholarships for students at the University of Arizona, University of Illinois at Urbana-Champaign, University of North Carolina, University of Washington, University of Texas Rio Grande Valley, and Virginia Tech; vocational training programs, including Autism Works at a New Leaft, Inc. in Tulsa, Okla.; the Boys & Girls Club of Saline County in Benton, Ark. ; Christ the King School in Seattle, Washington; the Shawnee Mission Education Foundation’s Project Lead the Way in engineering at the Shawnee Mission in Kansas; Pine Bend Elementary School in Inner Grove Heights, Minn.; the STEM club at Martha Turner Reilley school in Dallas; the YWCA of Greater Cincinnati; and Tucson Clean & Beautiful for road-side clean ups. In August 2017, a large, slow-moving hurricane made landfall southwest of Houston. Hurricane Harvey became a Category 4 storm in just 40 hours, landing near Rockport and Fulton, bringing with it wind gusts of more than 130 miles per hour. HCSS, a construction software company, was spared from flooding. However, 25 company employees in the Fort Bend County community were not so lucky. More than 200,000 residents were impacted, with 6,824 homes damaged in the county. Approximately 20 percent of the county’s land area was impacted by flood water, necessitating nearly 10,000 emergency rescues and resulting in three deaths. Homes across the county took on multiple inches of floodwater, ruining all possessions inside. Unlike most storms, which make landfall and quickly move inland and away from the coast, Harvey stalled over the Gulf Coast for several days, producing catastrophic and deadly flash flooding. Cedar Bayou in Houston recorded a new North American record of 51.88 inches of rainfall in less than 48 hours, and more than one-third of Houston was underwater. Nearly 40,000 people were forced out of their homes and into shelters. All told, the storm damaged 203,000 homes, destroyed 12,700, caused more than $125 billion in damage and had affected 13 million people from Texas through Louisiana, Mississippi, Tennessee, and Kentucky as moved its way through to the eastern U.S. The storm also claimed 88 lives. HCSS continued normal business operations as much as possible during the storm, with many employees working from home in order to continue meeting the “24/7” customer service needs of customers from around the country. But several employees had in mind to do much more than just proceed as normal. HCSS coordinated cleanup efforts in the community, spending $27,000 on supplies. It also provided a staging area for those supplies and others donated by customers, coordinated 1,200 volunteers who donated 20,000 hours to clean up 250 homes, and housed Christian Aid Ministries workers who came to Texas to help with cleanup. Employees and customers also raised nearly $150,000 via a “Go Fund Me” campaign to help other employees impacted by the storm.